Located southwest of Jishi Town in the Salar Autonomous Couty of Xunhua, the Foer Residence of the Tenth Pancen Lama is a compound building complex with one-story houses in the south and three-story structures in Tibetan style. These buildings are brightly painted, elegant, grandeur and luxuriously decorated. 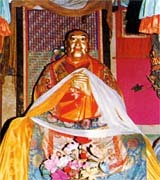 In the north are chapels, which enshrines the dead of the Panchen Lama.